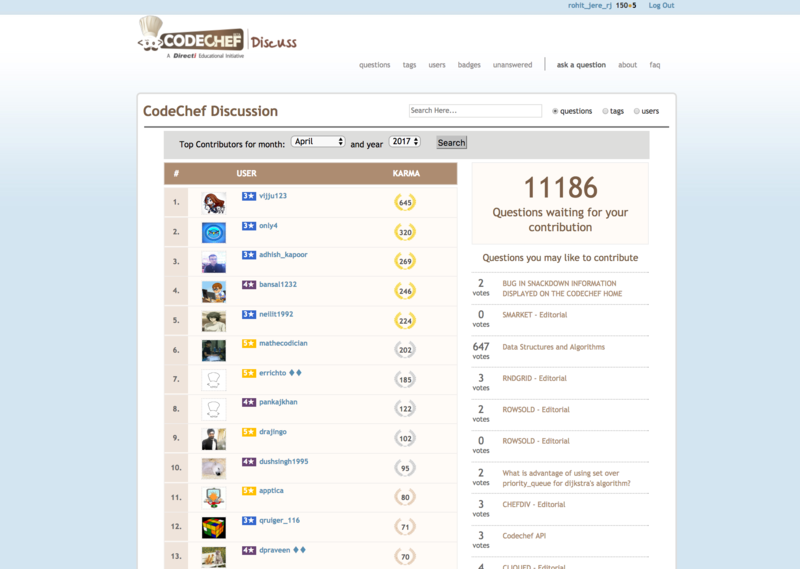 @admin I cannot see my name in the Codechef Discuss Top Contributor Rank list? I wanted to know how to enter the Codechef Discuss Top Contributor Rank list. Is there any specific method to get into the rank list or the rank list in updated automatically? If so, then there must some issue/bug. I have received 170 Karma Points in April. But I am not listed in the list. Please check and take necessary steps. Please try to log out and Log In again in this session. Basically this situation occurs when we are not logged IN with any of the account. If Problem still persist then only @admin will sort out this issue. This is your total karma or karma for this month only ? You haven’t participated in any contest yet as I can see you have no star. So it could be the reason behind not putting you in top contributors list( top contributors reflect to enough excellence to contribute, means to help others). So just participate in any monthly contest, show your excellence and get some star. And bam, you’re in the list. Disclaimer: Theses are my opinion, but you should definitely reach to the @admin anyway. It is strange and doesn’t usually happen. It can be a bug or admin suspects you of using unfair means to get karma. Sorry for the communication delay over email. It happened because due to some technical glitch your account was being shown as suspended, and hence top users was not including it in the list. @only4 I have reported them, but they don’t reply back. Did try your suggestion. But no change. Yes. I joined this forum 2 to 3 days back. If you scroll down the list, you can see many people without star and they are still in the list! @admin has not logged in from last 12 hours. @admin thank you so much!